For well over 2,000 years, philosophers, theologians, and other thinkers have debated questions about consciousness, free will, and other related topics. As the 20th century opened, the burgeoning fields of psychiatry and psychology began to make their contributions to these topics; however, until fairly recently the issues were limited mainly to debate and discussion. But now the neuroscientists have entered the field, bringing a new language and new tools to focus on the questions. Dr. Gazzaniga is well qualified to describe and discuss the seven topics in this book. He draws on both his own extensive research into the workings of the human brain and the many contributions of other scientists in trying to help us understand this complicated three pounds (give or take) of stuff we call the human brain. 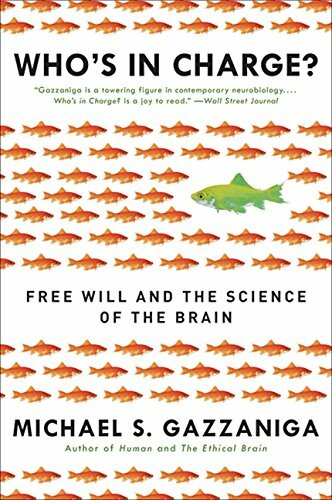 His writing style is informal, and Dr. Gazzaniga is careful to explain complex scientific data in terms that those outside the neurosciences can understand. But he gives a detailed narrative that paints a complicated and fascinating picture. Since his area of research involves split-brain individuals (due to birth, accident, or surgical intervention to treat a specific neurological disorder), it is not surprising that several sections of the book explore topics in this category. Going well beyond the “left brain/right brain” personality issues of pop psychology, Dr. Gazzaniga explores behavioral and perceptual issues that arise when the complex interconnections between the two sides of the brain are disconnected. These sections are best read with a diagram of brain anatomy close by at hand. The findings raise challenging (and, as yet, unanswered) questions about how our brains function and how we perceive the world around us. One of the ongoing issues in philosophy, religion, psychology, and the neurosciences is this knotty idea of free will. Allied with this issue is the question of the relationship between the mind and the body. Traditionally, many scholars subscribed to a dualistic approach, considering the mind and the body to be somehow separate entities that interacted with one another. The rise of the scientific world-view began to challenge both these ideas. As we learned about the “laws of science” and their role in determining behavior in the physical world, we began to assume that the mental and behavioral worlds were also deterministic. Instead of free will and the ability to make independent decisions, the assumption among many today (both neuroscientists and philosophers) is that our behavior is predetermined by both evolutionary patterns and neurochemistry. The firing of specific neurons when triggered by specific impulses causes specific actions to occur. Dr. Gazzaniga struggles with this idea, exploring research studies that either support or rule out the idea of free will, depending both on the specific study and the interpretation offered by the research group. Interestingly, he shows that most people believe in the idea of free will in spite of the challenges offered by the neuroscientists. Further exploration shows that many of the “hard” scientists (such as physicists) are quietly challenging the idea of strict determinism by pointing to findings in the area of quantum mechanics. A related issue comes with the idea of right and wrong, crime and punishment. Dr. Gazzaniga very ably summarizes a number of recent studies dealing with the question of personal responsibility for a crime. If a person is driven by deterministic influences, then they cannot be held responsible or their misdeeds. He explores the question of innate morality, asking if there are certain moral principles that are imbedded in each of us. While avoiding the theological aspects of this question (the inclusion of which would definitely enliven the discussion), he argues for an evolutionary basis for these shared cultural moral principles. One of the many benefits of this book is the extensive list of references that document the scientific research described in the chapters. Dr. Gazzaniga furnishes us with a lengthy bibliography, allowing the interested reader the chance to explore further the many challenging ideas put forth in the book. Even better, he provides URLs for many of the materials that appeared in nonresearch publications such as newspapers and popular magazines. Who’s In Charge? can be heavy reading for those lacking a background in the neurosciences; however, the reader who perseveres will be richly rewarded with both new insights into the working of the human brain and new questions about the implications of the findings of contemporary neuroscience.